BSM Media partnered with Beaches Resorts to create Beaches Resorts Social Media on the Sand, an invitation-only social media conference. 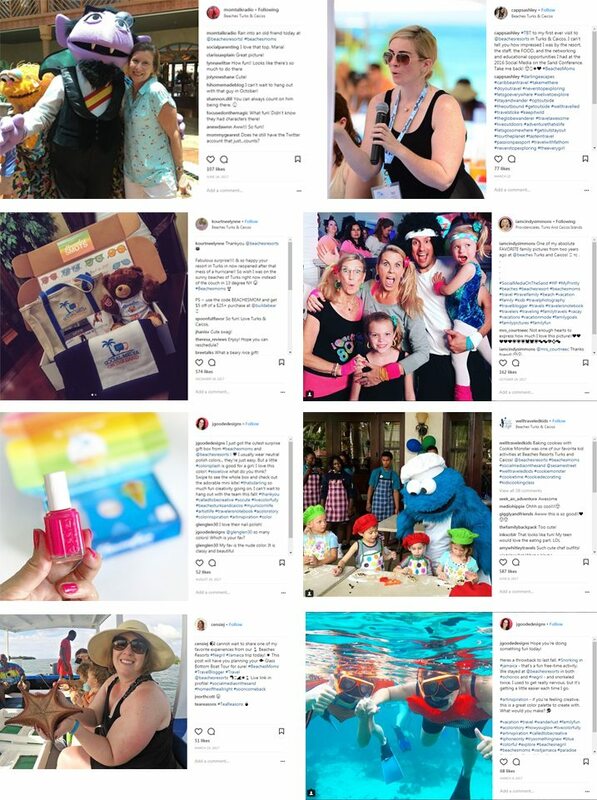 Attendees sharpen their social media skills during this immersive and completely unique event through inspiring and empowering sessions, while connecting in the Caribbean and creating unforgettable memories amid an incredibly beautiful island setting. The 2nd annual Beaches Resorts Social Media on the Sand conference took place on October 21-25, 2015 at Beaches Turks & Caicos Resort Villages & Spa. With 125 mom and dad digital influencers in attendance, every aspect of the weekend was Tweeted, Facebook, Instagrammed, and blogged. We worked with two event partner brands to promote before and during the event, and feedback was positive. As an event partner, Lands’ End swim tees were included in one of the surprise and delight pre-event mailers. Weeks before the event, attendees received surprise packages featuring a Lands’ End swim tee to bring on their trip. With conference day sessions taking place outside on the beach, attendees were encouraged to wear their swim tees to protect their skin from the sun. Daily’s Cocktails also participated as an event partner. Daily’s Beach Edition frozen pouches were included in one of the surprise and delight pre-event mailers. Attendees received boxes featuring a bottle of color-changing nail polish from event partner Del Sol along with a Daily’s Beach Edition frozen pouch. They loved the surprise and responded with excitement on social media! In addition to the surprise and delight mailers, Daily’s Cocktails was included in the pre-event Twitter Party, the conference website, the conference app, and conference signage.